The main learning approach in ImmiSoft Estonian language courses is the whole-brain teaching. It is an instructional approach derived from neuro-linguistic descriptions of the functions of the brain’s left and right hemispheres. The whole-brain learning means that the learner makes connections that tap both brain hemispheres and thus, make the learning process much more productive. According to the Ebbinghaus Forgetting Curve our memory is like a sieve, as we forget almost half of what we have learned within first 20 minutes! Of course, you can improve your learning results by repetition, which is a rather commonly used method in left-brain language teaching. However, repetition is a stressful process and stress forms a 'mental block' that hampers language acquisition. To learn faster and with better results you need to reduce stress and involve your whole brain into the learning process by creating links and associations. Most second language teaching methods are directed to left-brain learning. Many language instructors believe that left brain learning strategies are effective and thus, the put the emphasis on the strategies that involve only the left brain hemisphere. Examples are pronunciation exercises, dialog memorizations and grammar drills. The evidence shows that second language learners who have threaded their way through traditional language courses succeeded only because they were naturally able to switch from the left to the right brain. However, most students in traditional language classes struggle with language learning and find it difficult. This is one of the reasons as well why adult learners often give up and fail in second language classes. Right-hemisphere activities must occur before the left hemisphere can process language for production. In the whole-brain learning, learners are encouraged to visualize, imagining is seen as the basis for comprehension. 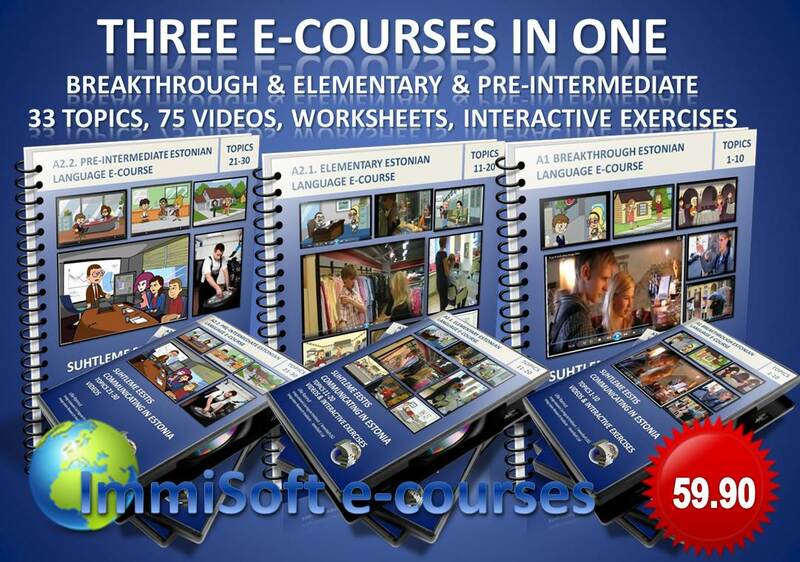 For this reason, ImmiiSoft e-courses use storytelling, pictures and animation. ImmiSoft Language Learning Materials help you to learn Estonian with correct pronunciation faster and with better results because of the whole-brain learning approach. Learn faster and Be Successful By Using Your Whole Brain! Mind Mapping for Success! Click Here! Our memory for words is like Google network in which each point represents a different word, with each linked to words and associations that relate to it. To memorize new words we must create more associations or so-called mental hooks that help us remember. By creating more associations it is easier for your brain to absorb new information and for you to memorize these words and phrases. Ralph Haber's research reveals that individuals have a recognition accuracy of images between 85 and 95 percent. We associate and remember images because they make use of a massive range of your cortical skills, especially imagination. Images can be more evocative than words, more precise and potent in triggering a wide range of associations, thereby enhancing creative thinking and memory. For this pictures, animation, stories and sounds are used as well in ImmiSoft language learning programs and videos. Research shows that the use of images and colors helps you recall all information, especially languages, much more effectively. It is much easier to memorize words in context, such as phrases and stories, for example. Stories and phrases build a context for the new words that creates images in your brain and thus, help you to process and retain information easier. Using words in context enhances greatly the chance you will remember them. It is always a good idea to learn words with a phrase as an example. Thus, putting words into a story form makes the language learning much more effective. Mind maps are a good example of the whole-brain learning, Mind map is extremely powerful thinking tool which reflects externally what is going on in your brain. Mind maps help you to learn thousands of words and phrases much more easily than traditional methods and this is for two main reasons. Mind maps provide the structure for learning by grouping related concepts together. And this mirrors the way your brain stores the new information. Secondly, mind maps are visual and the research shows that the use of images and color helps you recall all information, especially languages. ImmiSoft language teaching materials use a lot of different Mind Map activities as we have found it to be useful and effective in second d language learning process. Another aspect of whole-brain teaching is involving physical activity and acquiring language in a natural environment in the meaningful social interaction. James J.Asher says that right-hemisphere activities must occur before the left hemisphere can process language for production. Drawing on work by Jean Piaget, Asher holds that the child language learner acquires language through motor movement - a right-hemisphere activity. Right-hemisphere activities must occur before the left hemisphere can process language for production. Similarly, the adult should proceed to language mastery through right-hemisphere motor activities, while the left hemisphere watches and learns. When a sufficient amount of right-hemisphere learning has taken place, the left hemisphere will be triggered to produce language and to initiate other, more abstract language processes. According to the research the right-brain based language teaching methods of James J.Asher have been astoundingly successful for both children and adults, and has been used for a variety of languages. Adult TPR students of German who had had only 32 hours of instruction outperformed two control groups who had traditional instruction, one that had 40 hours and another that had 80 hours. Spanish students with 20 hours exposure did better than comparisons with 100 hours on tests of listening and reading (Asher, 1972). Language acquisition in the meaningful social interaction in a natural social environment. The acquisition-learning distinction presented by Stephen Krashen states that adults have two distinct and independent ways of developing competence in a second language. The first way is right-brain language acquisition, a process similar, if not identical, to the way children develop ability in their first language. Language acquisition is an unconscious process developed through using language meaningfully which is different from conscious leftbrain language learning (consciously learning or discovering rules about a language). Krashen claims based on several research results that language acquisition is the only way competence in a second language occurs. Language acquisition is a subconscious process; language acquirers are not usually aware of the fact that they are acquiring language, but are only aware of the fact that they are using the language for communication. The result of language acquisition, acquired competence, is also subconscious. We are generally not consciously aware of the rules of the languages we have acquired. Instead, we have a "feel" for correctness. Grammatical sentences "sound" right, or "feel" right, and errors feel wrong, even if we do not consciously know what rule was violated. Other ways of describing acquisition include implicit subconscious learning, informal learning, and natural learning. In non-technical language, acquisition is "picking-up" a language. We have the ability to naturally, quickly, and easily learn new languages. Brain is a magnificent, wonderful learning machine, capable of easily grasping and retaining more information than you can possibly come into contact with. And in just the same way, just as naturally as you learn and remember all the things you pick up along the way, you are also capable of absorbing, organizing, and recalling new languages. Acquiring language by using it in a meaningful social communication in a natural environment through practical activities and role plays is much more effective than learning it in a traditional classroom. Language acquisition does not require extensive use of conscious grammatical rules, and does not require tedious drill. Bearing this in mind, the language course in the adaptation program for new immigrants in Estonia places emphasis on stress-free natural language environment and communicative task-based approach. Language teaching is conducted through practical tasks in real life situations, and is integrated with activities of everyday life. Educational work is conducted primarily in the form of a language club that best meets the European principles of language teaching to adult immigrants.